Rain delays the mixed final, which is set to be completed at Forest Hills. The day after Longwood ended the USTA suspended Dennis "the Menace" Ralston for his behavior during a recent Davis Cup tie in Cleveland. This knocks Ralston out of Forest Hills-including the mixed doubles. Thus for no fault of her own Darlene is denied a chance at a triple-for she won both the US singles and doubles this year. Last edited by Rollo; Jan 29th, 2017 at 04:12 AM. Vicki Palmer d. Billie Jean Moffitt 6-8 5-0 ret. Last edited by Rollo; Sep 25th, 2012 at 10:53 PM. Last edited by Rollo; Jan 18th, 2017 at 04:18 AM. A badly sunburnt Graebner can offer little resistance to Bueno in one of the more lopsided slam finals in recent memory. The Mixed doubles saw a long 1R match as, Judy Tegart/Ed Rubinoff d Vlasta Kodesova/Milan Holocek 6-3 3-6 19-17. The 69 game QF topped it, as Smith/Newcombe d Bricka/Froehling 21-19 10-12 6-1. Last edited by Rollo; Jun 7th, 2016 at 03:15 AM. Ceci Martinez d. ???? ???? Virginia Wade (GB) d. ???? ???? Edrich/Mangin get two default to reach the semis without hitting a ball, then fail to win a game. Susman defaulted in protest for not being seeded after she drew world #1 Smith in round one. She is replaced in the draw. Another absentee was Christine Truman, who injured her Achilles tendon in the Wightman Cup. Last edited by Rollo; Aug 23rd, 2011 at 04:19 PM. 17 year old Margaret Michael listed as Peggy in results section by the NYT=Peggy Michel. Virginia Welch listed as Mrs James O Welch Jr. Rain on the first two days resulted in a Monday finish. 5,000 saw the finals. The women's final was over in a mere 41 minutes. By comparison Alison Danzig of the NYT wrote that the Casals/King vs Durr/Sherriff match "was sensational for the fury of the hitting in the first set." Durr/Sheriff won the middle act, and then Rosie and Billie Jean went on a 4 game tear where they gave up only 4 points. Frankie and Gail fought back, but the 0-4 deficit was too much to overcome. The NYT has Pat Cody (from Bell, California) losing twice in the opening round! Is the even possible? Could she have lost then have been reentered in the draw as a lucky loser when another entrant dropped out? This is so unusual surely it would have been mentioned somewhere. World Tennis has Adrian Cox, a male name. Mark Cox and his wife Alison Stround Cox were in the Husband/Wife event. This strongly suggests that "Adrian Cox" was in fact Alison Cox. Last edited by Rollo; Jan 18th, 2017 at 04:20 AM. August 31 to September 10. Draw of 78. Richey withdrew at last minute. Most women got first round byes. In draw order. Last edited by Rollo; May 22nd, 2017 at 11:12 PM. Doubles played for first time at Forest Hills since the men's and women's events were combined. This probably kept the draw size down-since the US Amateur was held the week before at Longwood. Old timers Pauline Betz and Gussie Moran last entered the US Nationals in the 1940s! Richey skips the Open after she and the event cannot come to an agreement on "expenses". She is still an amateur. NOTES: The 1968 US Mixed is a bit of an oddity. 1968 was the year of the first US Open but just before it, in Boston, the US National Championships were also held, open to amateurs and registered professionals (i.e. pros who were independant and not contracted to the promoters). The US Open at Forest Hills had no mixed doubles event but the Nationals did and that is it. Notes: King's first round opponent is Dr. Vija Vuskalns, a dentist. She replaced Helen Amos, who withdrew. Farel Footman replaced Betty Ann Grubb, Jade Schiffman replaced Tory Fretz, Betty Pratt replaced Emilie Burrer, Nancy Reed replaced Faye Urban, Joyce Davenport replaced Helen Gourlay, Peaches Bartkowicz is listed as replacing Reed? Last edited by Rollo; Sep 1st, 2018 at 05:29 AM. Doris Hart, the champion back in 1955, was back after 14 year's absence, though she confined herself to doubles. Darlene Hard, last seen in 1963-had a sensational and improbable doubles title with Frenchwoman Durr. Losing by the lopsided score of 0-6 0-2,they staged a comeback that had the small but noisy crowd on their feet as Hard and Durr sharpened their net play and Court tired visibly. Hard also got notice for her glam costume, a transparent organdie ballerina number trimmed with pink ruffles. Mr./Mrs. Curtis d. King/Emerson  9-11 1-1 ret. Heldman/Ulrich  d. Kemmer/Taylor 6-1 1-1 ret. #1 Seed Ann Jones withdraws. The second year of Open tennis brought back many old faces from years back. Karen Susman, full-time mom and retired 62 Wimbledon champ, was back. Doris Hart, the champion back in 1955, was back after 14 year's absence, though she confined herself to doubles. Darlene Hard, last seen in 1963-had a sensational and improbable doubles title with Frenchwoman Durr. No major upsets occurred in singles until the quarterfinals. 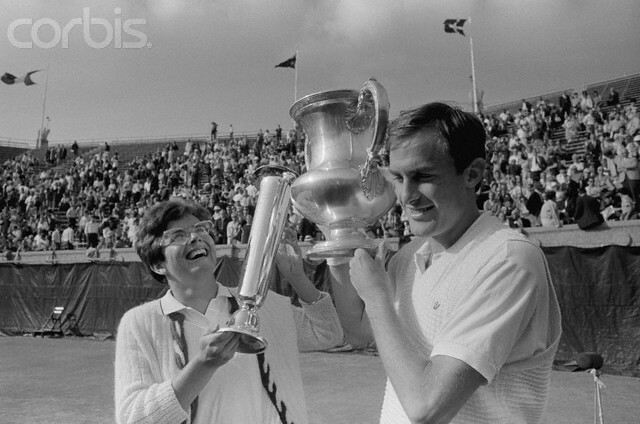 The withdrawal of #1 seed Ann Jones opened up the draw for feisty Rosie Casals, who easily gained the semis. Then came the upset. On the grandstand in 90 degree heat Richey drove King fron corner to corner. Billie Jean twisted her knee in the first set, the return of a knee injury that will require numerous operations over the years. King was gracious in defeat to a bitter rival. Court rolled on, but #4 seed Julie Heldman was undone by her own serve (she was called 8 times for foot faults) and the thunderbolts of Virginia Wade. Defending champ Wade and Court played on a rain soaked stadium dried by a rented helicopter. Virginia led 5-4 40-0 on Court's when the tide turned. An ace, one error, and a sizzling pass by Court spelled the end of Wade's run. After saving 3 set points Court was unstoppable. At 5-5 both girls put socks on over their shoes for more traction as the court got slicker. Wade was still hitting blazing winners but Court didn't let her win another game. Casals also had a set point in her semi on the grandstand with Richey. A backhand volley error lost it. "Rosie, like Virginia, produced exciting winners but they were too isolated." Richey quickly lost the final before a packed house. Nancy tried to take the net at every chance, but it is not her natural game, and Court's hard drives resulted in many volley errors on Nancy's part. All of Richey's loud grunts in chasing balls could only gain 4 games. The most Court lost in one match was 7 games. 20 games lost in 6 matches, with 5 of her 12 sets being won at love. Last edited by Rollo; Jan 19th, 2017 at 12:49 AM. #3 seeds perhaps withdrew, explaining the Graebner/Melville bye in 1R. Notes: Krantzcke was original 7 seed. Last edited by Rollo; Jan 19th, 2017 at 12:51 AM. Draw notes: #3 seed missing from draw. Virginia Wade turned her ankle before the Open and is probably this seed. The absence of Goolagong (who came to Canada but chose not to come here) was a dissapointment. Also gone were Wade (injury) and Court (pregnancy). Last edited by Rollo; Jan 19th, 2017 at 12:52 AM. *Note the odd addition of a Preliminary Round-which included seeds! *World Tennis has Gunter d Gail Chanfreau in the 1R by 6-0 6-1. Newpapers (including the NYT) list Aschner. We have gone with Aschner as the probable result, though it is known she lost to Penny Moor in the last round of qualifying. Could she have been a lucky loser? The first big upset came early, as Nancy Gunter lost to fellow baseliner Kazuko Sawamatsu, who ran Nancy to death from corner to corner then dropshotted her. Evonne Goolagong's debut at the US Open was a short run. Goolagong led Pam Teeguarden 5-4 40-15 when she was beaten by 2 powerful forehands. The Aussie got only 1 more game as she went down "slow of foot, languid in manner, and lost in some dreamworld of her own." Casals had Court on the ropes in their quarter. Margaret's husband Barry had to take their crying baby out of the stadium-and it looked as if Court was going to be crying as Casals led 4-2 15-40 on the Aussie's serve in the third. Ah, but the champ in Court then pulled out the stops, even if she did slip twice on the slippery grass,once with her racquet flying out of her hands. Meanwhile Rosie "wilted on the brink of victory", double faulting to end the match. Morozova threw it all at Evert-mixing up "nothing balls" with forays to the net. "No two returns were alike". Evert turned the tide and seemed to have it won, leasing 5-2 in the 3rd, when the Russian stormed back with flashing forehands to surge to 6-5. Chrissie barely survived by sweeping the tiebreak. "It had been a sparkling, thrilling. memorable contest. It was voted the women's match of tournament. Wade "fought like to tigress" vs. King, but could only manage to fend off 5 match points before going down. 'The two semis were contrasts in style and personality. King-Court was full of robust, forceful, all-court attack, while the Kerry Melville-Chrissie envcounter was all-femininity, reminiscent of the 1930's in it's baseline exchanges." King was more consistent in her attack-Court made too many forehand errors to keep up. Kerry's "forceful forehand" had Evert on the move, throwing in the occasional drop shot to take Chris out of her groove. Evert got to almost every one, only to have Kerry rocket a passing shot by her. Melville's win shocked the stadium, who were xpecting a Billie Jean-Chris final. Chrissie-mania was more subdued than in 1971, but the women (and the Open) were still big attractions in large part because of her. When there were complaints about the women getting "too much exposure" Chris and her sister Jeanne were scheduled for an outside court "there was nearly a riot". All of singles matches were in the stadium. The final was closer than any of King's other matches, but her serve was too much for Kerry, who almost capitalized on the strong wind that sprang up in the second set. Melville had leads of 4-3 and 5-4 but couldn't break. The potted grass at Forest Hills is finally prompting open calls to move to a clay surface. Some are even advocating taking the Open from FH because the facility is getting old and too cramped to handle the crowds. King won a Pinto Station wagon, which was driven into the stadium during the trophy ceremony. After winning the 3 biigest slams one writer declared King "must certainly be included among the handful of tennis immortals." With the rule on non-white discarded BJ won with a "see-through" dress and bright blue sneakers. In her press conference afterwards King threatens a boycott of next year's open if the prize money isn't distributed more equally. She got $10,000 for her victroy compared to Ilie Nastase's $25,000. Last edited by Rollo; Jan 19th, 2017 at 12:54 AM. Note: Althea Gibson entered the qualifying, but withdrew before her first match. Last edited by Rollo; Jan 19th, 2017 at 12:55 AM. #3 seed Olga Morozova withdrew, replaced by Rayni Fox. Last edited by Rollo; Aug 14th, 2016 at 04:56 AM. Last edited by Rollo; Jan 19th, 2017 at 12:56 AM.